When growing cabbages from seed you will need to sow your seed quite early on in the year – around about the beginning of February – in order to achieve a good sized cabbage in the autumn. For an earlier crop, you can start them off under protection in order to achieve a quick germination. Fill the tray to overflowing with John Innes ‘Seed and Cutting’ compost then lift the tray up and tap it down on the bench twice to consolidate the compost. One seed tray will take about 25 seeds, but space the cabbage seed out individually so that each germinated seedling will have the optimum amount of space to develop. Lightly cover the seed over with the same compost, but this time pass the compost through a fine garden sieve. Sit your prepared tray into a second – slightly larger - tray holding no more than an inch or so of water. 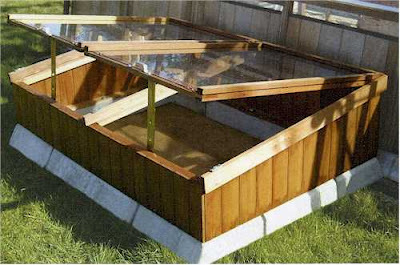 Allow the water to be naturally absorbed into the compost until all of it is moist – you may need to add more water to the bottom tray in order to achieve this. You will know when the compost it saturated with water as the surface of the compost will change from a light brown to a dark brown colour. After covering the seed with the fine compost give the surface a spray of water through a hand sprayer. This will ensure that the seed are not disturbed and keeps them at the same depth that you sowed them. At this point you can cover the seed tray with glass until the first seedlings emerge or give the surface a light spray of water on a daily basis or if it looks like the surface compost is likely to dry out. 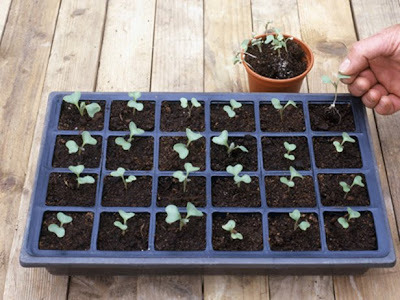 Place the seed tray in a propagator to germinate or leave on the bench if your greenhouse is heated to a minimum of 50°F. 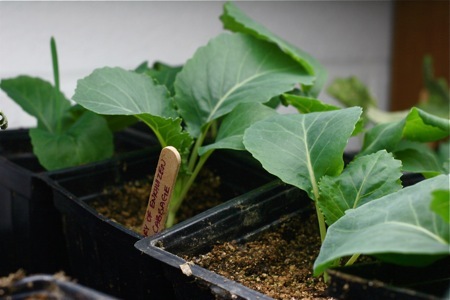 After the cabbage seedlings have germinated and showing two strong seedling leaves, transplant the seedlings into individual small pots or modules. 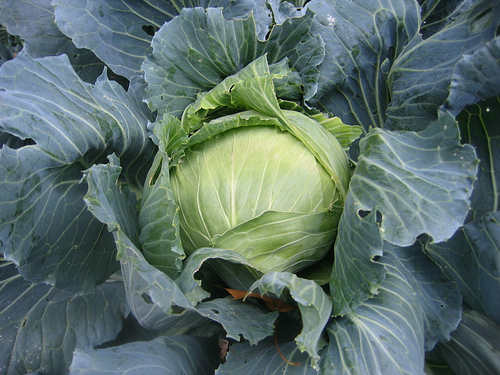 Cabbages, they must be looked after in order to achieve their optimum size and quality. Right up until they are planted outside, they will need to be re-potted on to a larger sized pot on a regular basis – at least until the weather has settled sufficiently to plant them out without the risk of damage from late frosts. 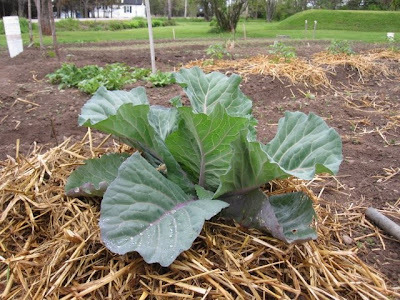 You also need to make sure that you spend adequate time in hardening off cabbage plants. Put them outside too early and you will not only risk physical damage to them but you can also cause a check to their growth. Start off by placing them in a ventilated cold frame during the day but remember to bring them back in over night. After a week or so - and when overnight temperature stabilize – you can eventually start to leave them out overnight in the cold frame. After another week they should be able to leave the cold frame altogether and be placed out into a sheltered area. 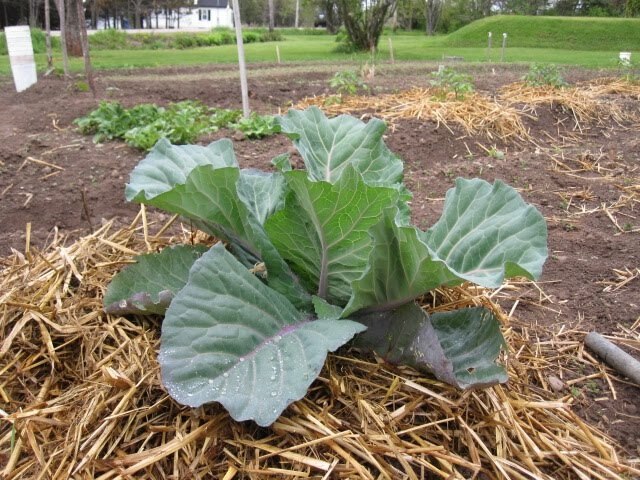 When it comes to planting your cabbages out into their final position, it is all about preparation Plant them in a well manured plot that ideally is free from club root disease. If you do have clubroot you can still achieve some really commendable heads by saturating the planting hole with a dilution of Armillatox made to the manufacturer's recommended strength. Before planting, liberally dust the hole with lime. To get good heads on your cabbages you must give them ample room for development. Ideally they need to be at least a 18 inches apart to 2ft apart and likewise between the rows. When they are planted out initially this sort of spacing will look a bit ridiculous and your young plants will appear lost on the soil. However, when your cabbages really start growing in earnest, you'll be struggling to work your way in between them.